You will be taught how to bend, mold and assemble wooden pieces to make a simple boat that will bring you hours of fun on the water. Working under the expertise of Karl, your group will experience the pride of completing a wooden boat by hand. 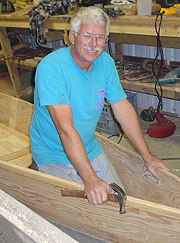 Karl has worked as a Boatwright for over 25 years and will teach the school. He has built multi-million dollar yachts, small skiffs and all sizes in between. Karl, is a gifted craftsman who loves creating with wood, especially wooden boats. He works with domestic and exotic woods, bending, splicing and gluing them into all shapes and sizes of boats. Karl's boat shop in NW Tennessee is filled with hand tools, and a touch of technology for time tested results. "The small wooden boat of yester-year is a piece of Americana that everyone should experience at least once," says Karl Weinert, Master Boat Builder. Do you remember these boats - they were built in garages and basements of people anticipating fun on the water. We are now settled in to our new location and began revisiting the idea of people learning the skill of assembling a small wooden boat. After researching the idea we found that there is a grassroots network of Family Boatbuilding Vacations held generally once a year in July. Encouraging families to bond together making a completed boat, experiencing the use of a hammer and the feel of a wooden boat on the water. We wanted to take the concept year round to make a better coincide with vacationing families please see our school schedule. Creating the memory and keepin' it afloat.